This is probably obvious, but keep your fenders maintained and securely mounted. I had an old front fender that became cracked, and then broke while I was riding. It caught on the front tire and stopped its rotation, which sent me and the bicycle flying through the air. The result was a bent bike and a broken clavicle. Big Mega Dittos from Santa Cruz on the fenders. I was a late convert, but fenders make a substantial difference in the amount of muck and mess that lands on me and my bike. 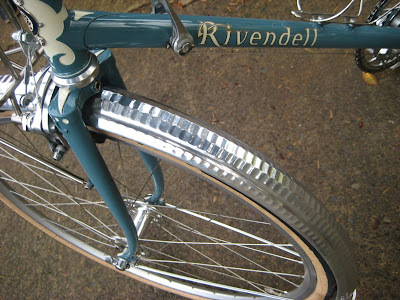 The Honjos on your Rivendell look lovely! Honjo or Velo Orange fenders are my favorites - lite, durable, and classic. Showers Pass makes dakine rain jackets, handsdown favorite of Oregon and Washington riders. I used to think fenders were for wimps, but now (after riding in some serious weather) I realize just how important those things are for keeping (your backside) dry. Thermoplastic mudguards (fenders, if you prefer) are fine for touring bikes, and bikes used only some of the year, but they simply don't last long on a bike which is used all year around. I've had many pairs in the past, all of which have ended up truncated for some reason or another. Steel mudguards as fitted at the factory to practical bicycles really are the thing to have for a reliable bike. The only bikes you find here which don't have "fenders" as standard are sport bikes. what kind of fenders are those in that picture and is there anywhere i can get a pair? Kaitlyn, those would be Honjo fenders. Available from Velo Orange among other places. http://www.jitensha.com/eng/fndrs_e.html. They are hard to find in the U.S. Try Clever Cycles.